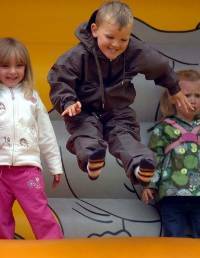 Heeley Festival 2009 | IT'S HAPPENING IN HEELEY! The cooking, dancing, singing and creative talents of people in Heeley were on display for all to see at a community celebration. Heeley Festival on Saturday boasted a packed programme of entertainment as well as local food, craft and community stalls. It kicked off with a samba parade and included everything from a car boot sale to live music, children’s entertainment and heritage events. Residents were able to cut down on food miles as they sampled goods from the local produce market which was held on Gleadless Road. People living in the area were also able to find out more about its history thanks to a display of work by Heeley History Group at the parish church. The line up of entertainment included Meersbrook School Choir, Boomshanka Tribal Belly Dancers, Heeley Hoofers and Escafield Brass Band. Families were given the chance to try their skills on a climbing wall and their sporting talents with the Activity Sheffield sports van as well as free drumming and street dance workshops with The Musical Works. The finale was a concert organised by Love Music Hate Racism and featured Retrospectives from Newfield School.